2kgames is set to release another major patch to Civilization V which will include game-balancing changes as well as the usual bug fixes which I hope will mitigate some if not most of the Civilization V crashes. The five months into Civilization V’s release has given the civ team at 2kgames certainly enough information and reports of overpowered or simply imbalanced strategies as well as optimize code where it’s needed. The February patch promises, among other things, Significant turn time improvements, so anyone still playing the game is bound to be delighted with that. 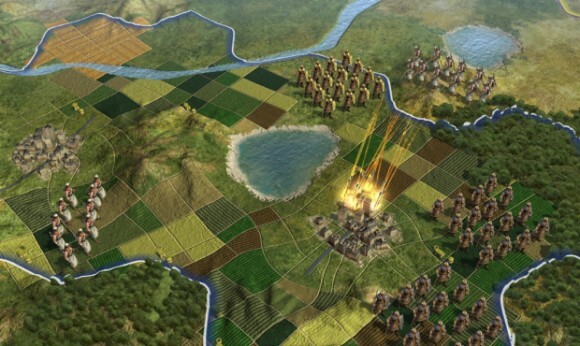 Dennis, the Civilization V producer at Firaxis also noted that future patches we’ll continue to iterate through Civ V systems and fine tune the balance of each one, and again offer bug fixes to anyone still experiencing issues :). It’s great timing for the patch too as Civilization V is currently on sale via Steam. Full details of the patch available after the jump. * Significant turn time improvements. * Invisible Rivers now display correctly. This caused many issues because the player could not see some rivers, like fresh water showing up in strange places, unit movement suddenly shortened, etc.. Basically, there were certain rivers that did not display where forks occurred, etc. * City-States now recognize when a road is connected for their road-connection quest. * Avoid cascades of denunciations against a single player. AI now uses its own current friendliness level with a given power to determine how much weight to place on a denunciation against that power. * Online Panel now displays TOTAL downloads for a mod and not just the downloads for that specific version. * When you click on a mod in the online browser, you may now use a dropdown to select a previous version. * Added Line Control for modders to use when creating graphs, etc. * Added Ring, Skirmish and Ancient Lake maps to MP. * Clear up cases where diplomatic status could show as “Friendly” even after that AI power has denounced the player. * Fix situations where AI demeanor and verbiage didn’t match friendliness level shown in diplomatic status string. * Additional bug fixes and tweaks. * Cities must now have three or more tiles in between them (1 more tile than before), unless separated by a sea/coast tile. * Bonus production from excess food (used when building settlers) tapers off if excess is 3 or more. * Balance pass on production and maintenance costs throughout the game. * Aqueduct added (entirely new building). 40% of Food is carried over after a new Citizen is born. * Removed 1 extra gold from Mine on Gems, Gold, Silver, Marble. * Fishing Boats give 1 food, not gold. * Fishing Boats give 1 gold with Compass. * Camps on Deer give production instead of food . * Remove 1 extra food from Sugar plantations. * Trading Post gold reduced from 2 to 1 (increases back to 2 when hit Economics). * Trading Post & Camp gold increases by 1 with Economics. * Lumbermill production increases by 1 with Scientific Theory (moved up from Steam Power). * Mine & Quarry production increases by 1 with Chemistry. * Plantation & Pasture food increases by 1 with Fertilizer. * Well & Offshore Platform boosted to 3 production (from 1). * Academy increased to 6 Science. * Landmark increased to 6 Culture. * Manufactory increased to 4 Production. * Tradition: Culture border expansion discount in cities placed on Tradition branch opener. Discount increases over the course of the game. Also grants +3 Culture in the capital. * Aristocracy: Wonder bonus reduced by 5% to 20%. * Legalism: Provides a free Culture building in your first 4 cities. * Oligarchy: Garrisoned units cost no maintenance, and cities with a garrison gain +100% ranged combat strength. * Landed Elite: +15% Growth, and +2 Food per city. * Monarchy: +1 Gold and -1 Unhappiness for every 2 Citizens in your capital. * Liberty: +1 culture per turn in every city. * Collective Rule: Settler production increased by 50%, and a free Settler appears near the capital. * Citizenship: Worker construction rate increased by 25%, and a free Worker appears near the capital. * Representation: Each city you found will increase the Culture cost of Policies by 33% less than normal. Also starts a Golden Age. * Order: Reduce Order production bonus to 15%. * Meritocracy: +0.5 Happiness for each city connected to the capital, and a free Great Person of your choice appears near the capital. * Angkor Wat now provides a 25% discount for the costs (both culture and gold) to gain plots empire-wide. * Krepost now provides a 25% discount for the costs (both culture and gold) to gain plots in the city. * Increased Oil quantity per resource. * Minimum Uranium is now 2. * Cut Deer Appearance in Arctic regions. * Adjusted Sheep placement so it is more spread out. * Decreased Wheat appearance in Plains. * Increases Cow appearance overall, including adding up to 2 Cow tiles to heavy grass start positions.